U.S. Supreme Court members, first row: Associate Justice Clarence Thomas, Associate Justice Antonin Scalia, Chief Justice John Roberts, Associate Justice Anthony Kennedy, Associate Justice Ruth Bader Ginsburg. Back row: Associate Justice Sonia Sotomayor, Associate Justice Stephen Breyer, Associate Justice Samuel Alito and Associate Justice Elena Kagan. Updated Tuesday, April 22, 1:45 p.m. EDT: Justice Sonia Sotomayor slammed the majority ruling of the court that upheld Michigan's ban on affirmative action in her written dissent, pointing out that without limitations, even a democratically approved legislation can be used to oppress. "We are fortunate to live in a democratic society. But without checks, democratically approved legislation can oppress minority groups. For that reason, our Constitution places limits on what a majority of the people may do. 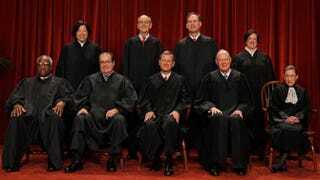 This case implicates one such limit: the guarantee of equal protection of the laws," Sotomayor wrote. "To know the history of our Nation is to understand its long and lamentable record of stymieing the right of racial minorities to participate in the political process," she added. "As members of the judiciary tasked with intervening to carry out the guarantee of equal protection, we ought not sit back and wish away, rather than confront, the racial inequality that exists in our society. It is this view that works harm, by perpetuating the facile notion that what makes race matter is acknowledging the simple truth that race does matter." The scathing dissent, which Sotomayer read aloud, came in at 58 pages, longer than the four supporting opinions combined, AP notes. Michigan's voter-backed ballot initiative that bans affirmative action in college admissions is constitutional, justices of the U.S. Supreme Court decided Tuesday morning. In a 6-2 decision—with only Justices Sonia Sotomayor and Ruth Bader Ginsburg dissenting—the plurality stressed that the "case is not about the constitutionality, or the merits, of race-conscious admissions policies in higher education" but "rather … whether and in what manner voters in the States may choose to prohibit the consideration of such racial preferences." Justice Anthony Kennedy wrote the majority decision with Chief Justice John Roberts and Justice Samuel Alito. Justice Elena Kagan did not take part. The initiative, referred to as Proposal 2, was approved by 58 percent of Michigan voters in 2006, effectively amending the state constitution to stop all discrimination and preference based on race in public education, government contracting and public employment. The U.S. Court of Appeals for the 6th Circuit had overturned the initiative in 2012, ruling it unconstitutional. Read the full decision here (pdf).